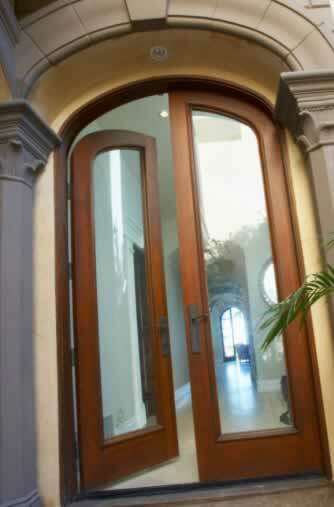 Attractive entry doors leave a first, and lasting, impression on your guests. Despite the age of your building, you'll find eye-catching glass doors that lead your visitors into a bright, gemlike gallery. Whether you choose rich oak or mahogany, or a restoration-style vinyl door, these insulated glass panes turn your home into a showpiece. True French doors can be fitted with frosted glass, decorative caming, energy-efficient double-paned panels, and contemporary latches, handles, knobs, and hardware that suit the vintage of your home while offering first-class security. Expert installation of the bottom rail and the sill ensure a snug fit. Light brown tones in the arched gallery enhance the dark richness of the wood. These glass doors prove that there's uncanny elegance in simplicity.